We had a great time at our 2nd Annual NDEW event in Cincinnati! Many test rides and drives were provided. BMW North of Cincinnati and Jake Sweeney Chevrolet were busy giving almost continuous test drives in the BMW i3, i8, 530e and Chevy Bolt. Many local EV owners also brought their cars and motorcycles to proudly show off, with several offering ride and drives in the Leaf, Volt, Model S and Model X. We also had a Cadillac ER, Toyota Plug-in Prius, and a Mitsubishi i-MiEV. 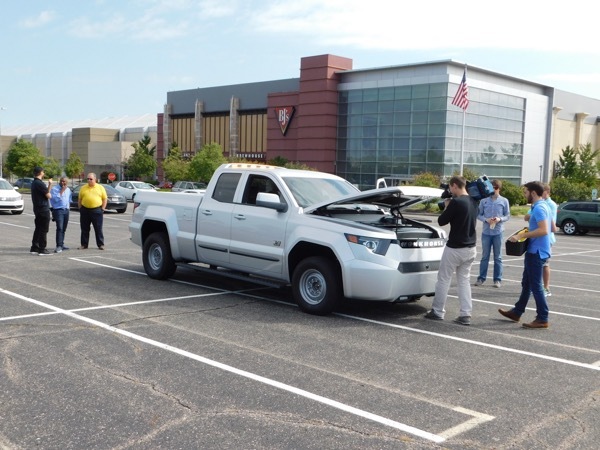 The local Workhorse Group made the Cincinnati debut of the first electric pickup truck ever built from the ground up, the hybrid W-15. Two local news stations were on hand to do stories about the truck. The Garage OTR brought multiple electric Segways, bicycles and scooters for people to try out, providing a lot of fun and entertainment! Already own an EV? Come put your car on display and talk to attendees about why you love driving electric. You are the best ambassadors for Electric Vehicles! Please register your vehicle on the website. We encourage everyone who is planning to attend to register on the website. Click the blue register button at the top of the page to attend this event and complete a short survey for a chance to win $250. We have lined up several local EV dealers to show off their vehicles and to provide ride and drives. 4. Tesla - Model S, Model X, Model 3 - first deliveries on July 28th! 7. Citizens Climate Lobby - Governments will respond to the will of the people provided we tell them what we want. And what we want is a livable world. 8. Clean Fuels Ohio - dedicated to improving air quality and health, reducing environmental pollution, strengthening Ohio’s economy, and enhancing our nation''s energy security by promoting and encouraging the use of cleaner, domestic fuels and efficient vehicles. 9. Piston Society Motorcycle Shop, Cincinnati - licensed Zero motorcycle dealer. Registered attendees report 551,086 electric miles driven.